A common skin disease that causes redness and swelling on the face. Often referred to as “adult acne,” rosacea may begin as a tendency to flush or blush easily, and progress to persistent redness in the center of the face that may gradually involve the cheeks, forehead, chin, and nose. It also may involve the ears, chest and back. As the disease progresses, small blood vessels and tiny pimples begin to appear on and around the reddened area; however, unlike acne, there are no blackheads. 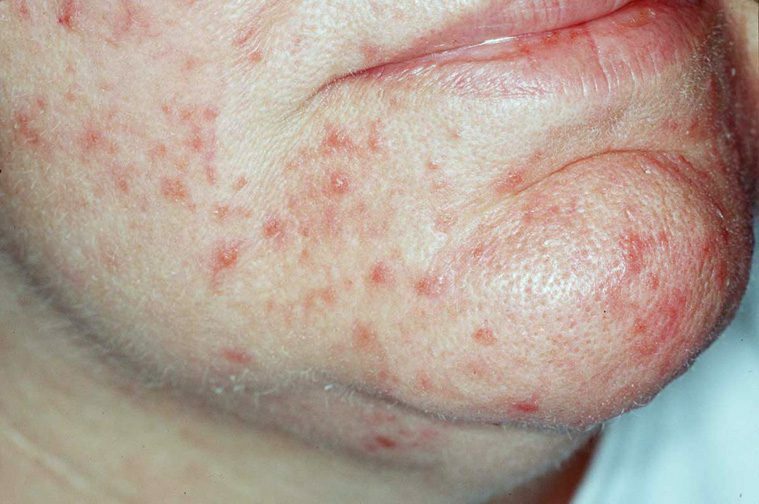 It is characterized by symptoms of facial flushing and a spectrum of clinical signs, including erythema, telangiectasia, coarseness of skin, and an inflammatory papulopustular eruption resembling acne. The use of daily broad-spectrum sunscreen is recommended for all patients with rosacea.A sunscreen that protects against both UV-A and UV-B light should be selected. Physical blockers such as titanium dioxide and zinc oxide are well tolerated. Additionally, the sunscreen should contain protective silicones such as dimethicone or cyclomethicone. Green-tinted sunscreens can provide coverage of the erythema. The patient is encouraged to avoid astringents, toners, menthols, camphor, waterproof cosmetics requiring solvents for removal, or products containing sodium lauryl sulfate. Non-ablative laser is effective against rosacea by remodeling of the dermal connective tissue and improving the epidermal barrier. The major disadvantage of this therapy is its cost because it is not covered by insurance. It requires 1-3 treatments 4-8 weeks apart to achieve the best results. Vascular lasers are the mainstay of rosacea therapy. These include pulsed dye laser (585 or 595 nm), the potassium-titanyl-phosphate laser (532 nm), and the diode-pumped frequency-doubled laser (532 nm). These wavelengths allow selective absorption by oxyhemoglobin, leading to vessel reduction with minimal damage to surrounding tissue or scarring. To be effective against deeper facial vessels, longer wavelengths of lasers are required, including the diode laser (810 nm), the long-pulsed Alexandrite laser (755 nm), and the long-pulsed Nd:YAG laser (1064 nm). Intense pulsed-light therapy is a multichromatic laser with different targets, including melanin and hemoglobin. Therefore, it is also useful for facial rejuvenation, affecting vascular lesions, pigmented lesions, and hair.